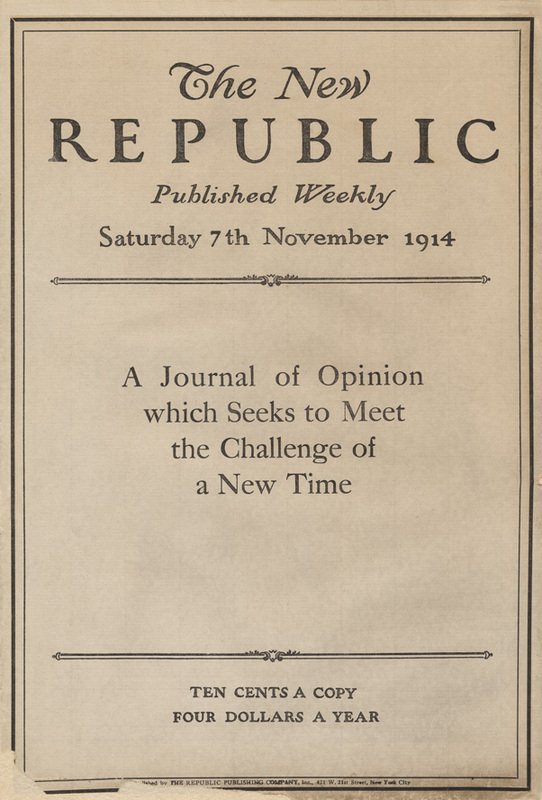 The New Republic is 100 years old. Yay! One cheer for incubating the careers of many great journalists. One cheer for being willing to go out on limbs and (sometimes) provoke the audience. The venerable magazine threw a big party for itself this week in Washington and invited a couple of hundred bold-face names. Just to keep up its intellectual cred, the magazine also celebrated by posting the thoughts of “100 Thinkers” who have appeared in its pages over the last century. But then, in an anti-intellectual move that is just the kind of thing that TNR does to exasperate its readers, the magazine’s editors decided to rank those 100 thinkers rather than link to the best thing those thinkers ever contributed to TNR. In any case, this seems like an appropriate moment to notice another dimension of TNR’s staying power: it has almost never made money, but it has always enjoyed the patronage of a wealthy person or family willing to subsidize its losses. For the first 40 years or so, it was the couple Willard and Dorothy Straight, who covered an estimated $4 million in losses (back when a million bucks was a lot of money). He was a banker, and she was an heiress to the Standard Oil fortune. For decades after that, TNR was patronized by owner/editor Martin Peretz, who married an heiress to the Singer sewing machine fortune. 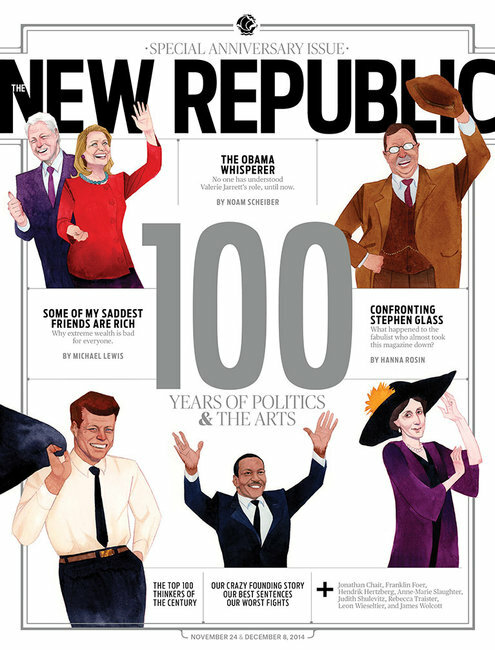 Now, the hole in TNR’s bucket is the problem of Chris Hughes, a zillionaire co-founder of Facebook. Paranthetically, let me observe that based on my study of journalism history, the patronage model works. In fact, it works about as well as any other — and better than many. TNR has enjoyed the backing of wealthy individuals whose fortunes were based on natural resources, industrial products, and social media. Here is a sketch of the founding of TNR that I wrote for my 2012 book Covering America. It is told from the perspective of journalist Walter Lippmann, who was one of the foundational hires at TNR and an ocasional contributor throughout his long career. Croly’s goal was to “be radical without being socialistic” and to advance the ideas he had propounded in his recent book, The Promise of American Life. In that book, Croly argued that the economic changes brought by industrialization called for a radically new approach. No longer could progressive politics be based on the agrarian ideals of Jefferson; Americans needed a new philosophy to match the times. They needed a program (sometimes called the New Nationalism) that brought the power of government into a new balance with the power of big business. The small, weak central government envisioned by Jefferson could not possibly deal with the challenges posed by companies like Standard Oil or the big meat-packing firms or the sugar trust. Instead, the country needed new agencies like the Interstate Commerce Commission or the Food and Drug Administration, staffed by a new class of expert public servants, that would have the power to police and guide these huge private enterprises. Nostalgia was useless; even trust-busting would not do the job. What America needed was a professional cadre of able but disinterested administrators who could provide leadership in the public interest. This was just the outlook that Lippmann had been moving toward ever since he left Harvard, one that ultimately drove him away from the populists, socialists, and muckrakers of his youth. With his new job and his new views, Lippmann began drifting away from the radical, downtown crowd at Dodge’s salon and began meeting more and more members of the Establishment, including lawyers like Judge Learned Hand and Professor Louis D. Brandeis. He continued to admire his childhood hero, Teddy Roosevelt, even as he began looking for new exemplars of public leadership. Which was ironic, of course, since Standard Oil was the emblematic target of progressive reform. I much prefer to see opinionated rich people put their money into magazines than into attack ads.